In a large bowl, cream butter, sugar, egg, and egg yolk until smooth. Stir in lime juice and lime zest. Combine the flour, baking powder, and salt; blend into the creamed mixture. Form dough into 1/2 inch balls, and arrange on the prepared cookie sheet. Bake 8 to 10 minutes in the preheated oven, or until lightly browned. Cool on wire racks. 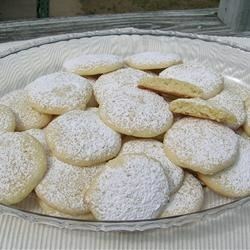 Sift confectioners' sugar over cookies while still warm. Creamy Key lime flavor with nutty crunch!